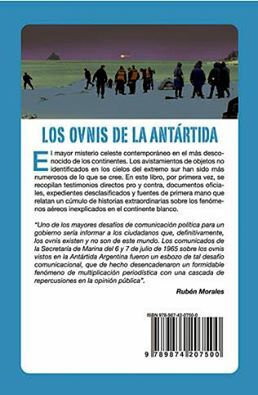 INEXPLICATA is pleased to announce the publication (in Spanish) of researcher Rubén Morales's Los OVNIS de la Antartida (UFOs of Antarctica) in recent days. Mr. Morales is a social psychologist and an instructor in public communications at the Universidad de Salvador de Buenos Aires, from which he also earned a masters in Political Marketing. 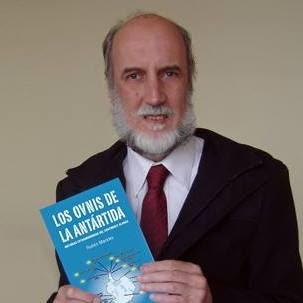 He has other publications on subjects pertaining to the South Pole in the Boletín del Centro Naval (Naval Center Bulletin), the Boletín de la Asociación Polar Pinguinera (Polar Penguin Society Bulletin), the Fundación Marambio and the British Antarctic Survey Club. The promotional release for Los Ovnis de la Antártida reads thus: "The greatest heavenly mystery in the least known of the continents. Reports of unidentified flying objectis in the far south have been more numerous than previously thought. This book collects direct eyewitness accounts - pro and con - for the first time, official documents, declassified files and first-hand sources that provide an array of extraordinary accounts on unexplained phenomena in the white continent." "One of the greatest challenges of political communications for any government," it goes on to say, "would be to inform its citizens that UFOs definitely exist and are not of this world. 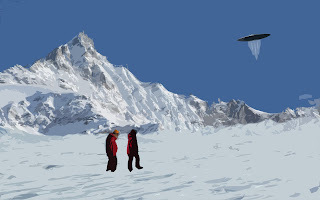 The communiqués issued by the Secretariat of the Navy on July 6-7, 1965 regarding UFOs seen over the Argentinean Antarctic were an effort at meeting such a challenge, which in fact unleashed a formidable phenomenon of journalistic multiplication, whose repercussions cascaded into public opinion".